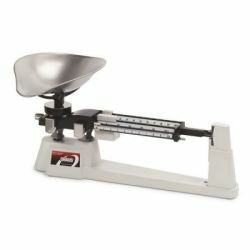 The Ohaus Triple Beam Balance (720-S0) is well-equipped to handle any weighing job, whether you're weighing solids, liquids, powders or even animals. The top loading Triple Beam Balance Series is known world wide as for its durability and versatility to accommodate a range of lab applications. 305 x 152 x 70mm / 12 x 6 x 2.75"